Tea is up there with coffee when it comes to everyone’s favorite beverage. There’s something so comforting about the aroma of freshly-brewed coffee. In many Asian countries, meals are often capped off with tea. Many also rely on its medicinal properties. Different types of tea have different medicinal purposes. If you want to relax your mind and body after a long day, you can brew chamomile or lavender tea. Their calming properties purportedly help people sleep better. If you want to rejuvenate your senses and get rid of midday fatigue, peppermint tea or lemon tea are always ideal pick-me-uppers. Although many teas are artisanal, and many people take pride in their own techniques in brewing delicious tea, it’s not difficult for the average person to prepare this for themselves. There are many commercial tea products available today. You can either get them in loose-leaf form or in tea bag form. Just let the tea steep in hot water. You can let the leaves steep in the water depending on how strong you want the taste to turn out. The quality of water is also essential when it comes to making tea. You would want to use distilled water as they are devoid from substances that can alter the taste of tea. Make sure they are also boiled to perfection. Nobody wants tepid tea. With this in mind, you need to have a teapot that you can rely on to boil water. Today, you can find different kinds of teapots but if you have an induction cooktop, you might want to look for a teapot specifically designed for this type of induction cooktop. What Are the Types of Tea Kettles? What Are the Qualities to Consider Before Buying a Teapot for Induction Cooktop? What Are the Materials a Tea Pot Should Have? Before knowing the top best teapot for induction cooktops, you must first understand the basics of teapots. It’s common that teapots are used to boil fluids of any kind, but this is mostly used for boiling water. There are actually two types of teapots available in the market. You can either choose from a stovetop or an electric teapot. But before you decide, it is important to know the difference and advantages of each type. Once you have learned, you can compare them and make a better buying decision. However, for induction cooking, the stove top teapot is most recommended. You cannot use an electric teapot on your induction cooktop. 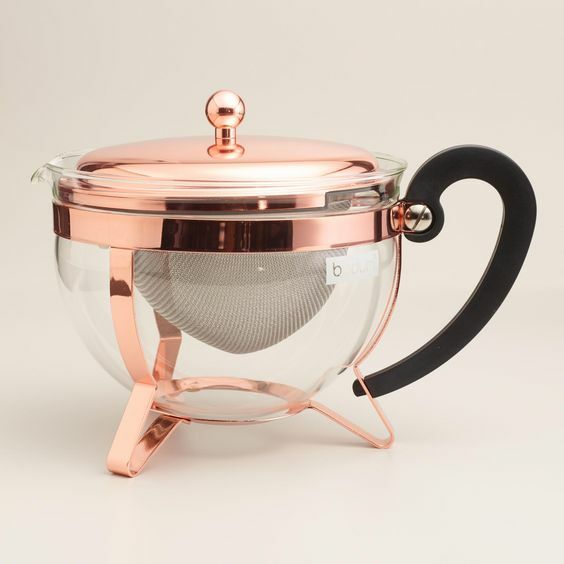 Stovetop teapots are created using stainless steel, copper, and other materials. Since they are not electric, you need a stovetop, induction cooktop, or a burner in order to heat the water. Electric teapot, as its name suggests, relies on electricity to operate. You just plug the cord included in it to an outlet. You can’t use it on a stovetop. One of its advantages is how fast it works in boiling water. There are also models that include an automatic shut-off feature. Since you are using an induction cooktop, you should also bear in mind that induction cooking is different from using your typical burner. If you will observe, burners or stovetops use direct heat from flames or electric elements, which is called thermal conduction. Induction cooktops, however, are supplied with a magnetic field which gives off heat. The magnetic field is responsible in the frequent magnetizing of the cookware in order to conceive massive whirlpools. The increase in the temperature is caused by the natural resistance of the teapot. The water inside the pot will then be absorbed. The process is quite tricky, so it is advisable to use a metal teapot instead of other materials. Boiling water in an induction cooktop may take some time, especially if you will use a ceramic tea kettle. Qualities to Consider Before Buying a Teapot for Induction Cooktop? Whether you are brewing green tea, red tea, white tea, or black tea, it doesn’t actually matter what type of kettle you will use. As long as the tea does not have a strange taste or the water does not affect its flavor, you are ready to go. If you are not regularly making tea, you could consider buying according to your preference. Since most customers often find teapots with useful functions and economical. But the most important thing that you should consider before buying the product is the material used. It doesn’t matter how many servings you will be making but rather the longevity of the teapot you are using. A small kettle could let you save energy since it allows the water to boil quickly. For a bigger crowd, you can choose a bigger kettle to accommodate bigger needs. 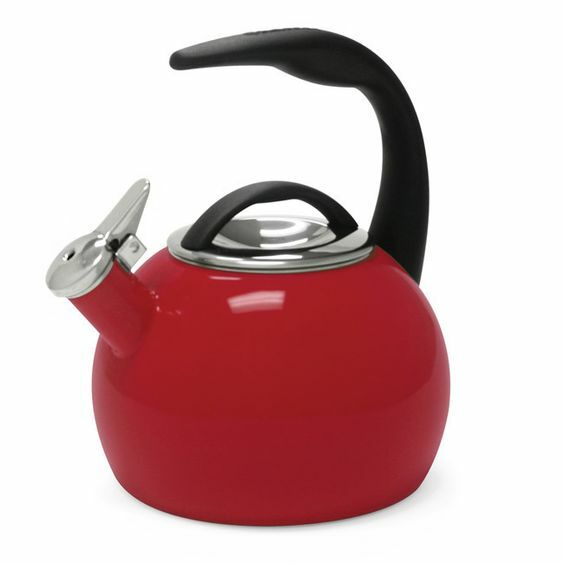 There are teapots available for brewing while there are also kettles that are designed for heating and brewing. Make sure the teapot you are getting is designed for brewing purposes. 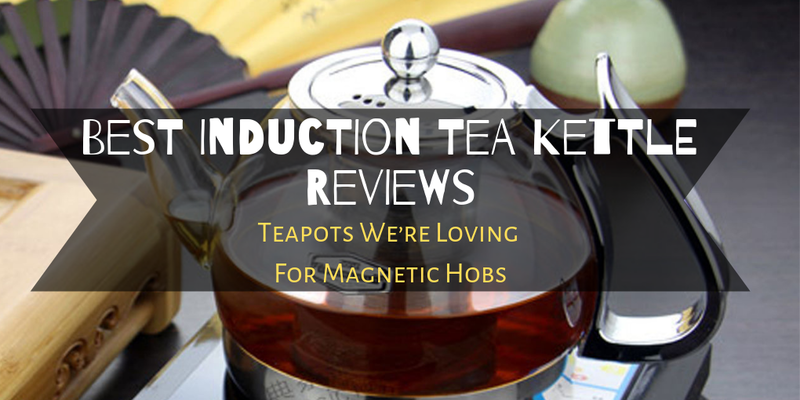 There are electric teapots that are compatible with induction cooktops. This will help you save money and time. These are also efficient to use. This actually matters the least. However, if you want to add up a traditional feel to your kitchen, then you can consider looking for teapots that would fit your taste. The design is often for aesthetic and practical reasons. As I have mentioned, the size of the teapot will also matter, especially if you will be regularly inviting your friends over. 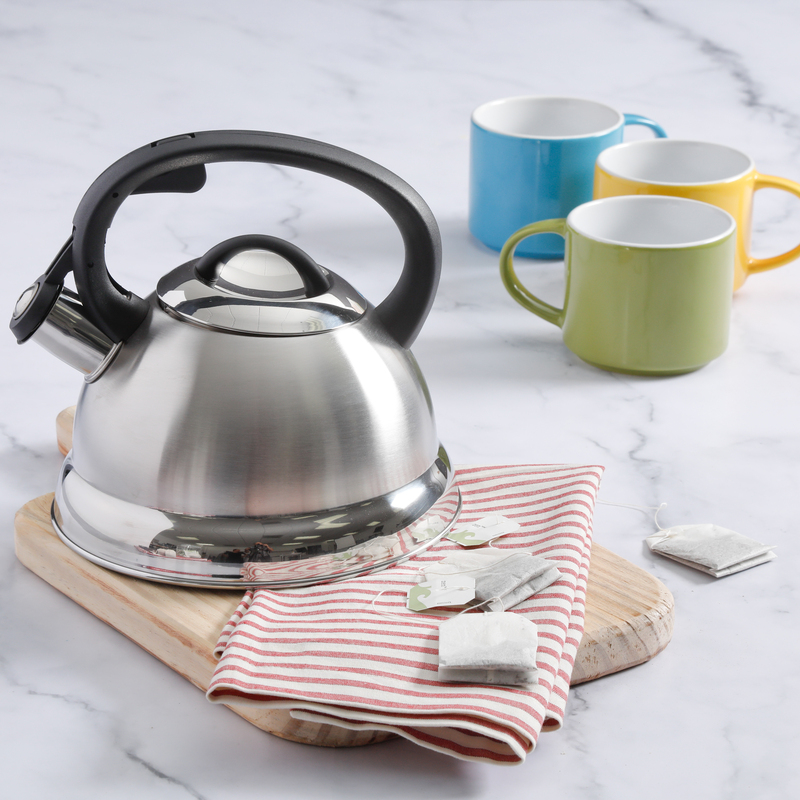 Look for smaller induction teapots if you often just brew tea for yourself or for just a couple of guests. It is important to check the equipment they used. The quality of the product should also be a priority. For induction cooktops, teapots made out of iron are usually recommended. Iron is a good heat conductor that could store heat, preventing the water inside from cooling down faster. 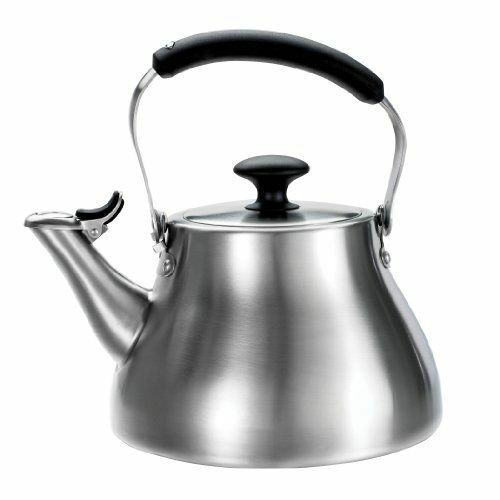 Stainless steel teapots are also an option due to their resistance. Maintaining the cleanliness of the teapot is important. Choose a product that is easy to clean and that are resistant to corrosion and to limescale buildup. 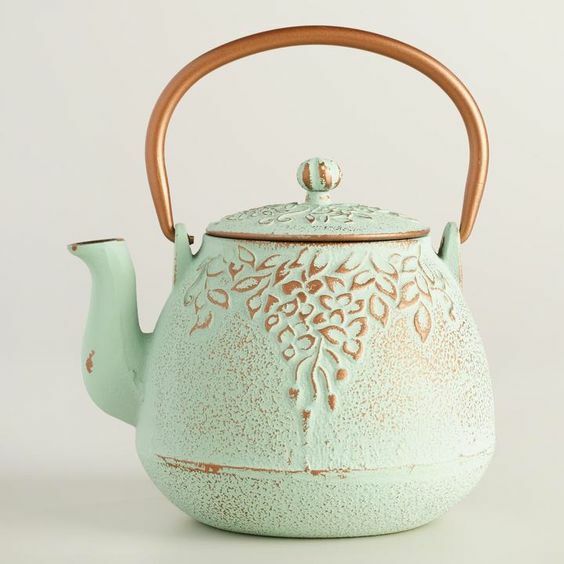 After knowing the qualities that you should consider before buying a teapot, you can now start looking for the teapot that will suit your taste. It won’t be easy to pick a perfect product, but you could actually base the qualities from the criteria mentioned above. 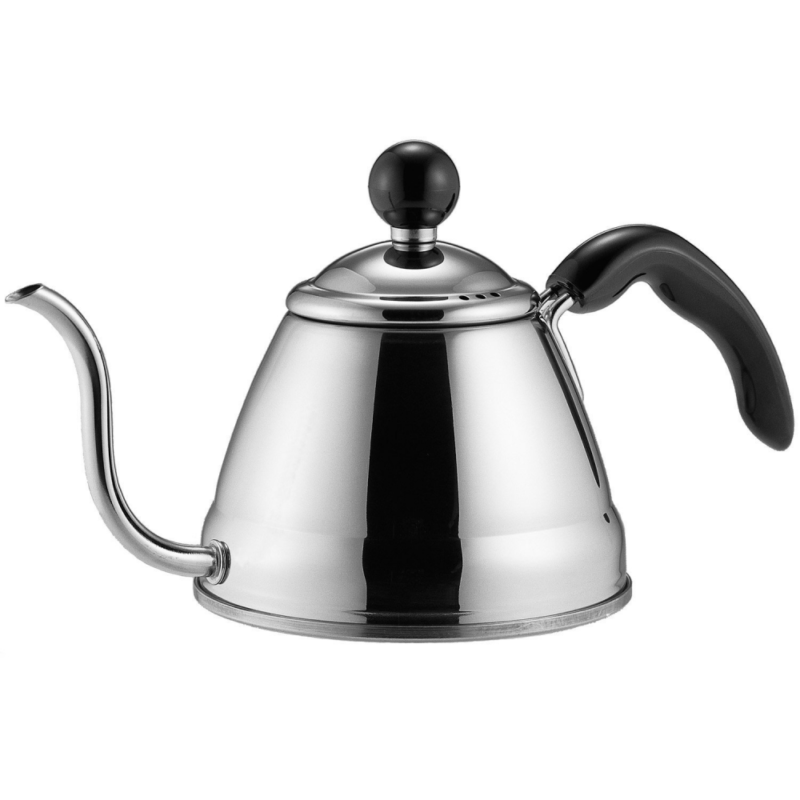 The Fino Pour Over Coffee and Tea Kettle will bring you both a traditional and a modern brewing feel. It is ideal for a small crowd, perfect for making the atmosphere more aromatic as you enjoy your lunch time. This kettle is designed with a narrow spout, with a curved gooseneck finishing its fancy design. The design also allows you to control the liquid as you pour it into a tea cup. With its design, you are able to slowly and precisely pour it over without spilling and burning yourself. Furthermore, you don’t have to worry about burning your hand since the thermoplastic handle is angled away from the heated pot. It is made out of stainless steel that can be used on stove burners, electric, and induction cooktops. Unlike other teapots, this type does not whistle which could be perfect for people who are looking for this quality. It has a 1-liter capacity which can fill 6 cups of coffee or tea. This teapot is easy to clean either in the sink or in a dishwasher. The drip features control the water when pouring it to avoid spilling or dripping. The lid of the kettle stays in place when pouring it over. There were some users who didn’t like how the lid tends to loosen up during the boiling process. The size is better for smaller brewing needs. 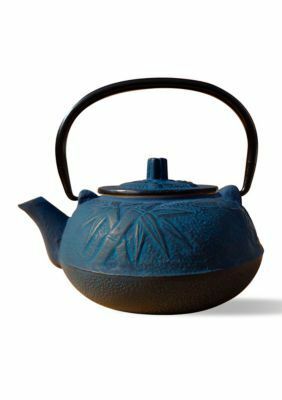 This teapot is a sturdy yet lightweight that could offer all the features that you are looking for. It is a whistling kettle made out of stainless steel with a brushed satin finish. When pouring out, you can just press the button that snaps out the cover of the spout spilling the liquid from inside. You must push the button back to close the spout with the cover. When the water boils, the user can quickly detect since the kettle whistles loudly. You don’t have to measure with a thermometer to assure its temperature. Though, you should not place it in the oven since it is not safe. The Bakelite handle also gives you comfort when holding the teapot. One thing the users will love about this product is the size which ranges from 1.5 quarts to 2 quarts. The handles and knobs are made out of Bakelite, which prevents burning. It has a button that you could press when opening and closing the spout cover. The teapot is sturdy, and you can choose from different sizes. You might need to take better care of it to prevent deterioration. 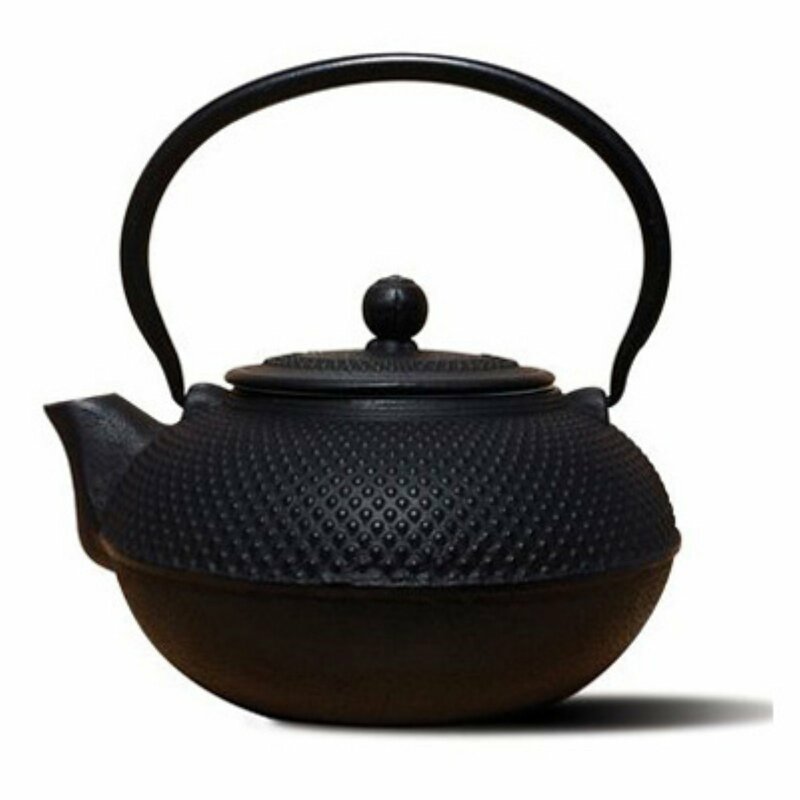 Enjoy a traditional Asian inspired brewing using this teapot. With this teapot, you won’t only feel the traditional way of brewing tea or coffee, but you will also add traditional design to your kitchen. The cast iron allows a longer time for the fluid to stay hot or warm even if it’s not being heated. It retains the warm temperature even after minutes of taking it off the induction cooktop. The teapot is designed with porcelain enamel interior which keeps the flavor and taste of the tea natural. This also allows you to clean the item easily. It comes with an infuser, a tea brewing basket made out of stainless steel, and a guaranteed warranty. When cleaning this teapot, you should use warm water to rinse before hand-drying it. The porcelain enamel interior coating prevents it from rusting. The teapot is sturdy and durable which can fill 5 mugs of tea. Its use might not be as flexible as others. It is perfect for brewing purposes only. 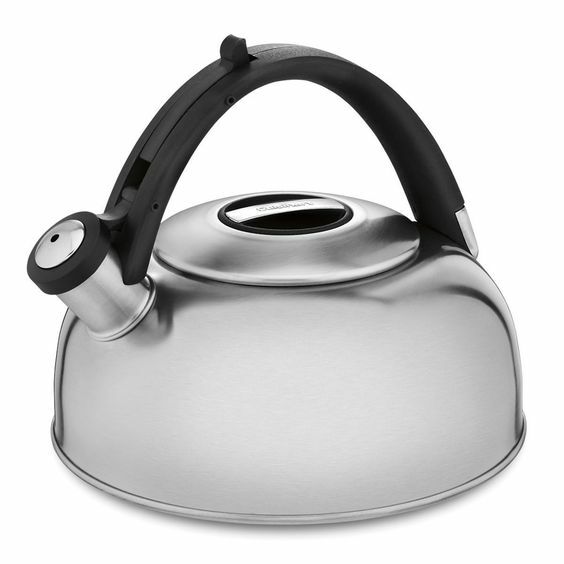 Aluminum teapots are often lightweight, making this material more ideal for campers and travelers. These tea kettles are designed from anodized aluminum, which offers energy efficiency. It can be a little pricey, but with its stain and scratch-resistant properties, it is worth buying. 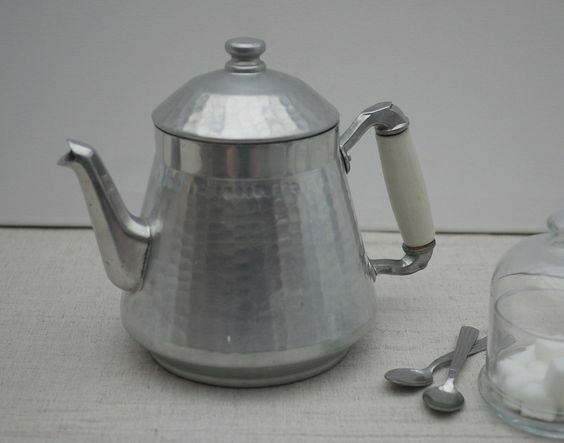 Stainless steel is one of the most used materials for teapots. Though it takes some time to heat up, you can dispense the need to clean it all the time as it stays in good shape even with minimal maintenance. This type of material is also inexpensive. However, if you are using a cookware with this material, it is advisable to use pot holders since the handles can get hot as well. Glass teapots are easy to clean and look classy. This type of material needs slow heating and it should be resting on a metal trivet while heating. The glass could easily break so you need to be a little more careful. This material is a good heat conductor, but you must avoid heating it on high heat. Usually, it requires medium heat which will boil the water rapidly. The maintenance, however, needs more cautiousness in order to prevent tarnishing. Use special cleaning solutions to avoid scratching. This type is usually thick and durable, but they can retain heat for a longer period of time. The maintenance is a hassle because you have to avoid scratching the enamel interior coat and you must properly clean it to avoid rusting. In every use, it is important to dry it. Having said all these, you should already have an idea what to buy. But to make things clearer, let us make a few suggestions. If you don’t need anything fancy for brewing tea or you only usually make tea for yourself, the Fino Pour Over Coffee and Tea Kettle should be more than enough for your needs. Finding the best induction tea kettle is not a walk in the park and we highly recommmend the Fino Pour Over Coffee and Tea Kettle. 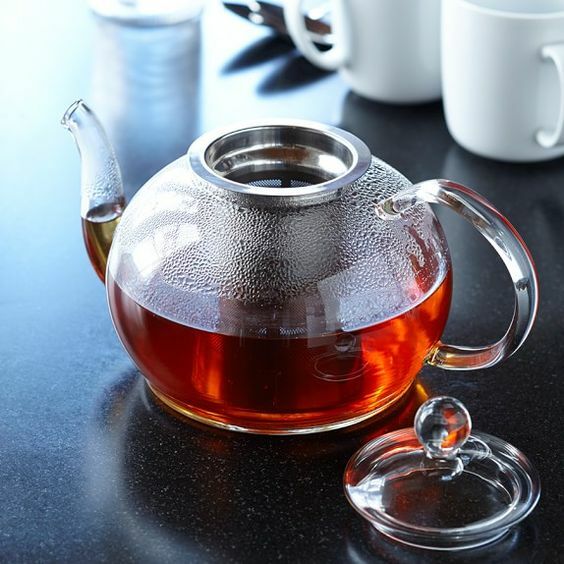 If you are looking for a teapot with all the bells and whistles, no pun intended, Mr. Coffee’s Flintshire Whistling Tea Kettle would be the perfect option with its stay cool handle and its whistling function. Get the Old Dutch if you are a serious tea brewer. It truly makes you feel like an expert. Since it retains heat for a long time, it’s great for entertaining friends or family over. It also comes complete with the things you need for brewing tea. You might be on the lookout for more cooking and kitchen essentials. Our homepage can help you find all the things you are looking for. Check out our product recommendations and reviews to learn more.